You also believe the pope is infallible. Bad idea. Papal infallibility only applies to Church doctrine, and it's a very good idea. The problem is the Bible makes it clear no man is infallible (excluding Jesus, but He is also 100% God). "For there is one mediator between God and mankind, the man Christ Jesus." The restriction of infallibility to doctrine, ex cathedra and all that, is only a comparatively recent dogma - necessitated by flaming papal "infallibilities" proven badly wrong. Your entitity's claim to "authority" rests on the lie that it is unchanging in dogma, which it is comically not. Up until Vatican II, marrying a Protestant was a mortal sin for which you would burn for eternity in hell. So apparently it was an absolute, eternal, unchanging truth then - but not today, right? 2+2=5 one day and 2+2=4 the next. "There is no salvation outside the church." Absolute unchanging truth before the 60s. Official doctrine repeated many times over and over again in papal bull after papal bull. 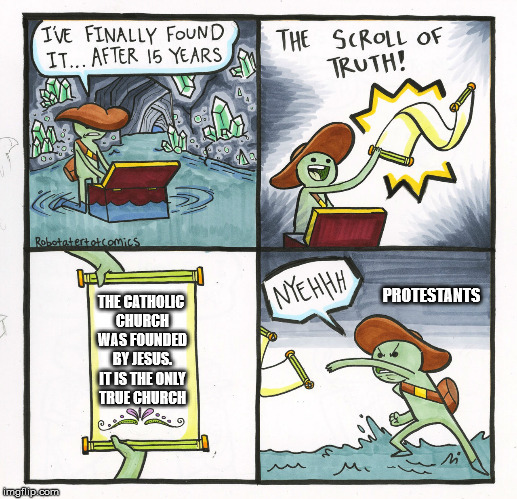 Absolute catholicism for centuries. 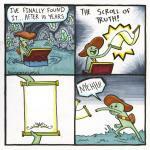 Now explained away and no longer doctrine. Your church in even the late 1800s condemned as heresy - in a papal bull, doctrine!!! - democracy and freedom of religion. It precepted that Catholic rulers suppress them. You therefore - by your own dogma - are an unforgiven heretic just for even believing in those. You goin to hell, bwah. Just for that. You are told not to worry about the contradictions of the Bible. Then what basis is there for the claim of your church's foundation? They say, well the church fathers taught a consistent body of doctrine. Bullcrap. They were CONSTANTLY excommunicating each other back and forth as heretics. The only reason Nicea "unified" anything was the church's violent bloodshed through the emperor Constantine. Rome never even CLAIMED supremacy over other bishoprics for centuries. You think you have been told the truth about ANYTHING in the history of so-called Christianity? Your church is maniacally genocidal for torturing and burning people at the stake for thinking differently. In fact many of those "heretics" would be excommunicably OVER-conservative today. These truths are so obvious that many conservative Catholics have felt forced to reject the pope and Rome itself as satanic or heretical. I kid you not. Go research for example Fr Feeney or sedevacantism. You are ignorant of the atrocities against native peoples, secret murders and political assassinations, and a thousand crimes more. As tightly as you cling to it, you cling those crimes against humanity to yourself also. The "one true" church you enslave yourself to is a myth, a lie, and neither one nor true. Stop believing everything you are told by "authorities." Go out and do your homework. Good thing there are no more indulgences. And the Bible can be read by everyone now. Which dead person did you pray to to get the ok to post this? The Catholic church is not a Christian Church for many reasons but the biggest one is that they have a false Gospel. It actually was the Orthodox Church. Coming from a Catholic.